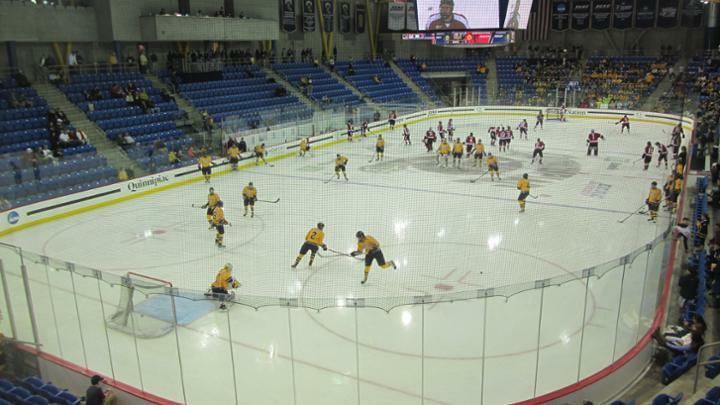 The Quinnipiac Bobcats open up the ECAC playoffs with a familiar foe in the Brown Bears a team that they beat the prior weekend to close out the regular season. Quinnipiac also won the first match up in Providence in early February 1-0. They are also the team that Quinnipiac has played more than any other team except Cornell in the ECAC playoffs since coming into the league back in 2006. The teams last met in the playoffs in the 2013 ECAC semifinals which the Bears won. That 2012-13 season has been Brown's best season in the last dozen years. Since then Brendan Whittet's team has gone into a free fall. Since winning 16 games back in in the '12-13 season, Brown has won 11, 8, 5 and 4 games in the last four seasons. This years team has the worst winning percentage for a Brown team since the 1988-89 season when current Dartmouth coach Bob Gaudet was in his first season with Brown and led them to a 1-25 record. Brown has never won the ECAC Championship having lost four times back in 2013, 1993, 1976 and 1965. The Bears last reached the NCAA tournament in 1993. Quinnipiac comes into this game having won five out of their last seven ECAC games albeit they came against teams much worse than them in the standings. Brown is 1-12-1 in their last fourteen ECAC contests since their last non conference game. Their lone win against a winning team this season came against Army of the Atlantic Hockey Conference back in early December. Quinnipiac has the better team on offense, defense, special teams and with goaltending along with having a massive coaching edge in this match-up. Brown has some nice offensive players notably Lafferty, Corcoran and Willman but they lack offensive depth and the teams defense just hasn't been good this year which has put too much pressure on freshman goaltender Gavin Nieto. Bruno's special teams are really poor which won't help with the Bobcats having one a top 15 penalty kill and a power play that at times has the ability put the puck in the net multiple times a game. I think Brown is going to have a tough time scoring in this series if they can't find offense outside of the likes of Lafferty, Corcoran and Willman who have contributed to 49% of Browns scoring this year. The task of Quinnipiac's defense should be able to focus on Brown's better offensive players in order to shut them down and keep them off the score-sheet forcing lessor players to produce for them which I don't think they will be able to do. Quinnipiac's Andrew Shortridge is also starting to find a groove in goal and should give the Bobcats quality play in the crease this weekend. Quinnipiac has the home ice, the better overall team and coaching staff along with a history of beating Brown in the postseason.